This is the most popular tattoo removal technique and is successful at removing most types and sizes of tattoos. It works by using varying light spectrum lasers to break down the ink into smaller particles that can be absorbed and ejected by the body. It is the best technique for small and large tattoos of varying colors. However, there are some drawbacks to consider. The procedure is expensive and takes a number of sessions that require time for healing of between 6 and 8 weeks. This means that it can take anywhere from 6 months to 2 years for the tattoo to disappear entirely. Color tattoos are more difficult to remove especially blue, green, yellow, orange and purple. Teal, that lovely blue-green color that is so attractive, is almost impossible to remove. The process is also quite painful to undergo. Excision is the surgical removal of a tattoo using a scalpel and is normally performed by a doctor or cosmetic surgeon. The procedure is performed using a local anesthetic to numb the area where the tattoo is located. 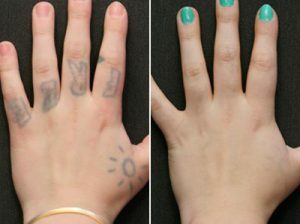 It is the most successful technique to remove a tattoo entirely but is however only suitable for smaller tattoos. The procedure requires a lengthy healing time like most types of surgery and can result in minimal to severe scarring depending on who performs the excision. This is the oldest means of removing a tattoo buy has grown less popular as it is not suitable for medium or large tattoos and because of the resultant scarring. There are some D-I-Y tattoo removal options that can be successful at fading a tattoo. These options do not actually remove a tattoo but simply fade it until it is less visible or becomes invisible to the naked eye. Tattoo removal creams are one of these options and contain chemicals that bleach the ink in the tattoo. The process may require some scrubbing in order to allow the chemicals to reach the dermis or second layer of skin where the ink particles are located. The scrubbing can be painful and the chemicals may burn. A popular home remedy for tattoo removal is the use of lemon juice which has acidic properties that will fade a tattoo much like a tattoo removal cream. Scrubbing the area is recommended before applying the lemon juice in order for the remedy to be more successful. D-I-Y tattoo removal takes time and it can take months or even years for the tattoo to fade to a point that it is no longer noticeable. The accumulated cost of tattoo removal creams can also become quite expensive. D-I-Y techniques are also less successful on some colored inks.